Not only is growing pineapples ridiculously easy. Growing pineapple plants is possible just about anywhere in the world! I grow lots of pineapples in my garden. If you plant them in the right spot they need virtually no care whatsoever. 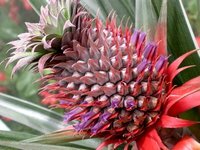 I love the fruit, I love the plant itself and its spectacular flower, and once you have a few pineapples... Well, they multiply like rabbits, so if you grow pineapples you eventually end up with lots. But let's start at the start. Here's all you ever wanted to know about growing pineapples (and then some). This page summarises all the essential information about growing pineapples. It's best to read this first. It may be all you need. Your pineapple tops are planted and doing well, now you need to know how to look after and multiply your pineapples. 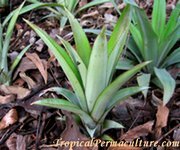 Learn how to propagate using slips and suckers and find pineapple growing tips and strategies. 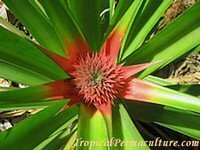 Ideas, tips and tricks for growing pineapples in a permaculture garden. Growing pineapples is easy if you get the basics right. You can get started several ways. Most people will start using the top of a shop bought pineapple. 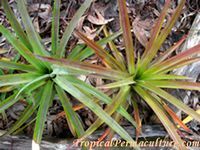 If you know someone who grows pineapples you may also be able to beg, steal or buy some "suckers" or "slips" (little plantlets taken of a mature pineapple plant). Don't put the little thing in a glass of water. I don't know where people get the idea that everything needs to be started in a glass of water. Really, that's absolute nonsense. It's actually better to let it cure or dry for a day or two before planting. If you use tops make sure you remove all the fruit flesh. You should also remove all the small bottom leaves. Just pull them off. The same goes for suckers. If there are very small or dead leaves at the bottom pull them off. Just make a small hole in the ground or in a pot and stick your little pineapple in that. Push the soil back in and firm it around the base so the pineapple sits straight and doesn't fall over. If the soil is dry give it some water. And that's it. It'll grow. The roots don't need much space but the plant itself grows to an impressive size. Pineapple leaves are very spiky, so make sure you put them in a place where they can spread without becoming a nuisance. They are nice to grow in clumps if you have room, or as a (wide) border along paths or driveways. Plant them at a distance of about a foot (that's pretty close but it's what I do anyway), and expect individual healthy plants to measure up to a metre across and a metre high. If you live in an area where water is scarce just give them what you can spare. Pineapples grow with very little water. Make sure your soil is thickly mulched to reduce evaporation, and consider growing pineapples under a bit of shade. How much and which plant food? Pineapples take up a lot of their nutrition through their leaves, and the first few months after planting they rely only on their leaves. You should make sure the plant food actually lands on the leaves. You can use liquid fertilisers like fish emulsion or seaweed extract. Make a very diluted solution and just use a watering can to put it on the pineapple plant and the surrounding soil. 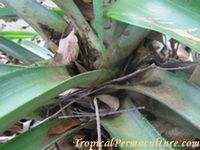 If you use something like pelleted chicken manure sprinkle it on the soil very close to the base of the pineapple plant (remember, very small root system) and make sure a bit falls into the bottom leaves. The best way by far is of course a natural and organic solution. Mix compost in with your soil before you plant the pineapple, and then mulch thickly around it. You end up with mulch and compost sitting in the bottom leaves, and as it breaks down it feeds the plant. The colour of the leaves of your pineapple plant will tell you how well you are doing. If they have a reddish, purple tinge then your pineapple is starving and you should help it a bit. It depends on the variety, on your climate, how well you look after them, and it depends whether you plant tops, suckers or slips. Growing pineapples from tops of shop bought pineapples can seem to take forever. Tops take about 24 months to fruit (even longer in colder climates). Suckers take about 18 months and slips can fruit within a year. Generally a pineapple will flower as soon as it is big enough, so the happier it is and the better you look after it the sooner it will flower. 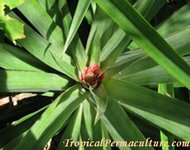 If you grow pineapples outside their ideal (tropical) range they take longer. The fruit is ready to pick when it starts to turn yellow. If you have four legged marauders, or if it looks like the fruit is getting sunburned, cut it now and leave it on the kitchen bench for a few days. Otherwise leave it on the plant until it's fully ripe and yellow. Cut it, eat it and plant the top :-). Once you have the first few pineapples growing it gets easier and faster. A mature pineapple plant produces lots of offspring and the suckers and slips fruit a lot quicker.